In Search of My Mother's Garden: "Summer Time and the Garden is Steaming"
"Summer Time and the Garden is Steaming"
What can I say, it has only been two months since my last post so I am getting better at posting on a consistent basis. Seriously, I've been meaning to sit down and chronicle everything that has been going on, but somehow it just doesn't happen. Instead, I've spend an inordinate amount of time catching up on old episodes of the wonderful BBC program, "Gardeners' World "with host Monty Don and about 15 hours of the 2014 RHS Chelsea Flower Show. I can say without any doubt that the English are truly passionate about their gardening, and I am in awe of how knowledgeable they all are in all aspects of gardening and horticulture. I only wish we had a gardening program half this good in the USA. Thankfully, I can access old episodes and the current season on Youtube thanks to some gardening enthusiasts willing to share this excellent series. I have probably learned more about gardening in the past four months than I have in my whole gardening career. If I didn't learn anything else, the most important thing I have come to appreciate is the use of the gardening fork in the garden. Prior to this, I had rarely ever used it, but since I began watching this series, I have discovered that it seems to be the British gardeners' tool of choice in the garden. It is great for cultivating, weeding, lifting, and does a better job of loosing the soil than a tiller. I am never without it now. I thank you Gardeners' World for my enlightenment. 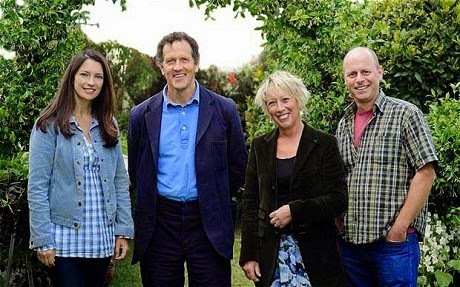 Gardeners' World presenters: Rachel De Thame, Monty Don, Carol Klein, and Joe Swift. Things have been progressing nicely in the flower beds. I have been very pleased with the second year progress and I continue to move things around and hopefully attain the balance I am seeking. I doubt however that I ever will, which is ok.
Year two back porch planting with knock-out roses, crepe myrtles, and daylillies. Shed garden I installed last year. I hope to extent this area in the coming months. 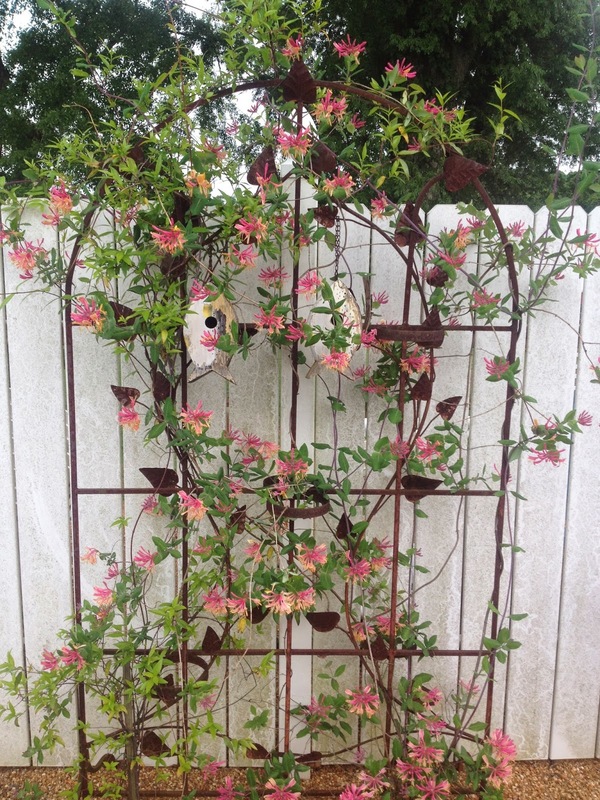 Honeysuckle and Jasmine on yard art. I am really pleased with the overall progress of the garden. Plants that did reasonably well last year are doing exceptionally well this year. 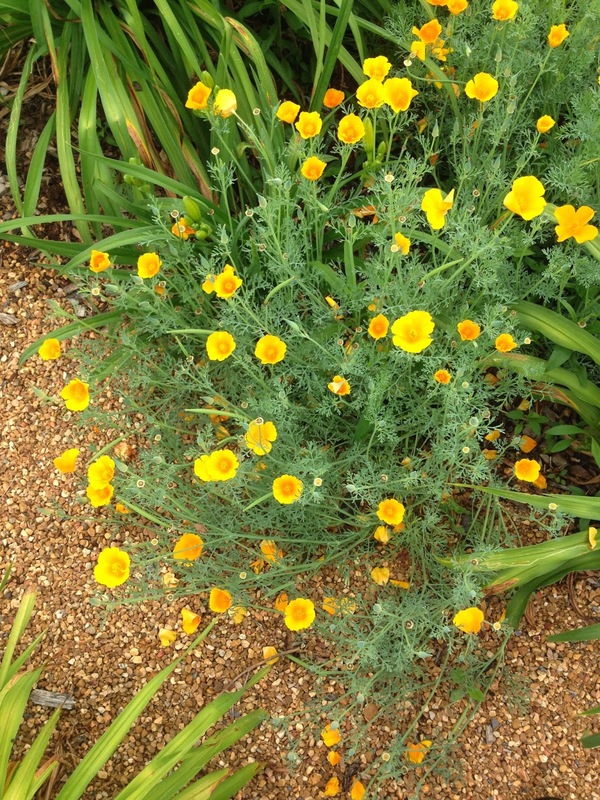 I sowed some California poppy seeds last fall and had quite a few come up this year, hopefully they will reseed and continue to make more. Last fall I decided to expand the vegetable garden so I used our old swimming pool cover to kill the grass on the area I wanted to expand. I left it until last spring at which time I removed it and incorporated several loads of compost/gin trash in the new beds. 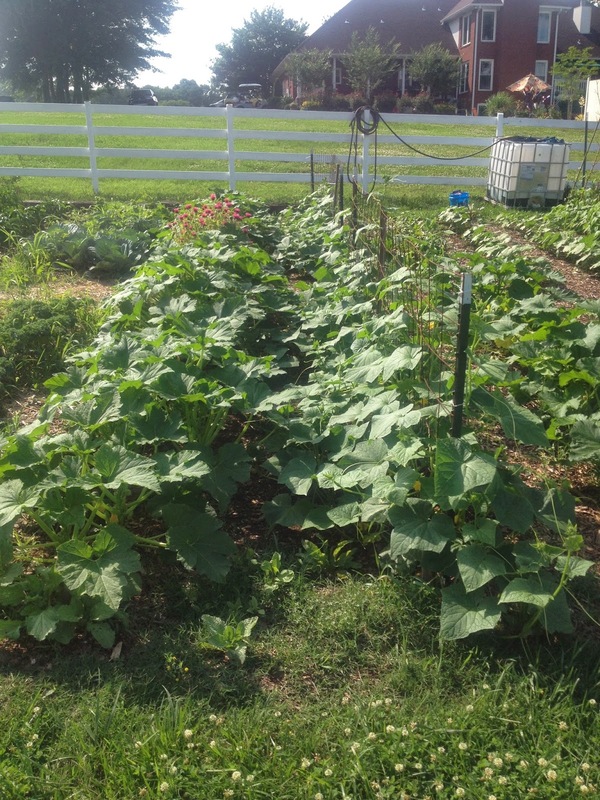 The garden is now approximately 30x80 and I have plans to expand it a little more this coming fall. The veggies did reasonably well last year but they have gone bonkers this year. 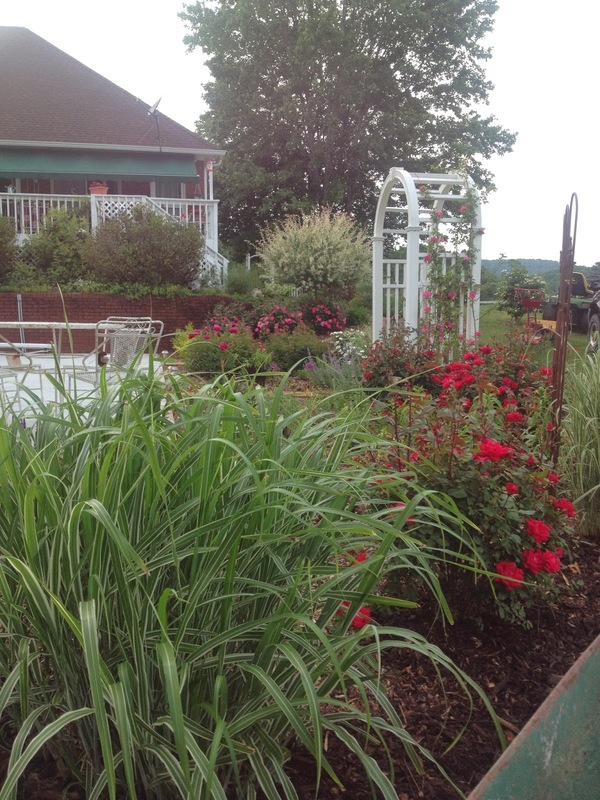 Everything has done exceptionally well and I am using fish emulsion and epsom salts as fertilizer this year. So far, I am really happy with the results. In April we took a road trip to the Amish Community in Ethridge, Tenn. to purchase vegetable plants at really great prices from several Amish farmers who had greenhouses on their property. Each house had a sign in front of the house which indicated what they had for sale. Eggs, quilts, canned vegetables, hand made soaps, birdhouses and plants were just a few of the items offered for sale. I bought heirloom tomatoes, banana peppers, jalapeños, bell peppers and eggplants. We had a great time and will plan to go again next spring. 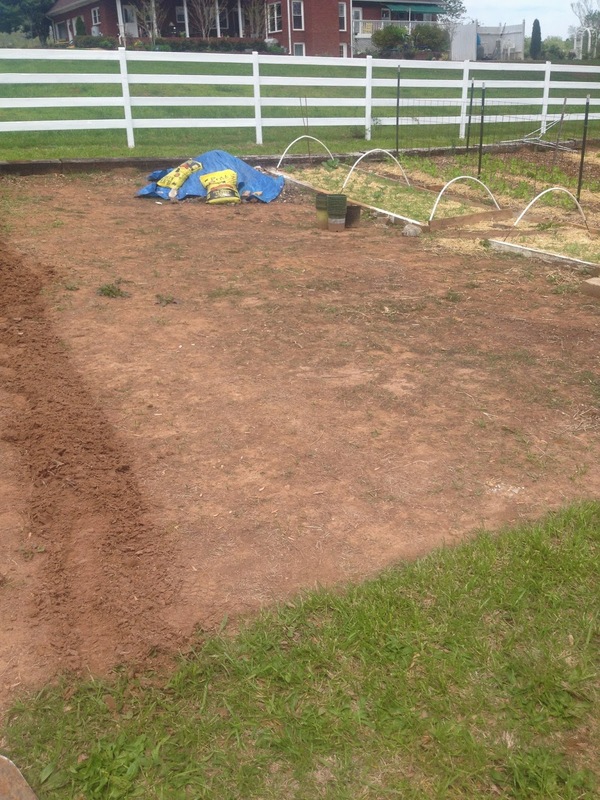 Ground cover removed for the new garden expansion. After composting, cultivating with garden fork ( my new best tool) and planting. 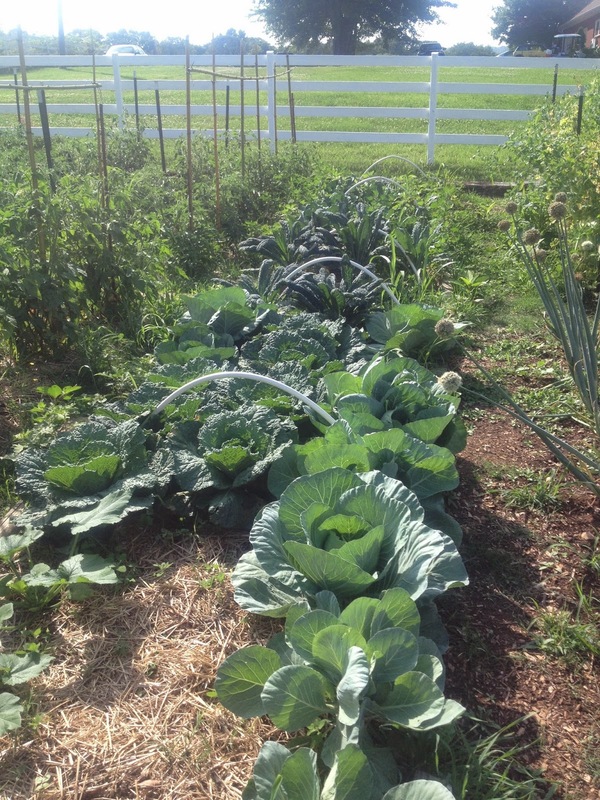 This week, I continue to harvest kale, cabbage, cucumbers, squash, zucchini, in addition to rattlesnake pole beans, and okra. The first of June I harvested garlic I planted last October. Cynthia braided it and it is now hanging in the barn to dry for storage. Today we harvested some honey from the bees in our original hive that we installed last Spring. The new hives continue to do well and we have already added supers to both hives. We will not harvest any honey from these hives this year, but hopefully will be able to next year. We also helped our good friend and mentor Mike McMahon process the honey he collected from his three hives, which yielded almost 18 gallons of honey. We hope to do as well with our hives in the next couple of years. Your gardens are simply beautiful !! !